Ortis is a Nord warrior and a devout worshipper of the Daedric prince Sheogorath. 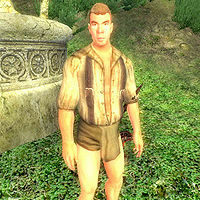 He can be found near the Shrine of Sheogorath and is, like his fellow worshippers, completely mad. Ortis spends his entire existence near the Shrine, either wandering around or sitting on one of the two available benches, looking at Beewos who constantly bows behind the nearby lectern. He never eats nor sleeps. He wields an iron dagger and a leveled war axe of the best possible quality. He doesn't wear any pants, only a shirt with suspenders and a pair of blue suede shoes. He carries a small amount of gold. When you approach him, he will point you towards Ferul Ravel with this unsettling dialogue: "I wish there were children here. Scrumptious, darling children. I haven't eaten in so long. Ravel will tell me what to do. You, too." This page was last modified on 20 October 2015, at 05:38.